Artist Rick Shaefer works on a charcoal self-portrait with himself dressed as an armor clad Don Quixote during Open Studios weekend at the Nest Arts Factory at 1720 Fairfield Avenue in Bridgeport, Conn. on Sunday, November 13, 2016. The whimsical piece features a monkey carrying a chicken and a rhinoceras. Rick Shaefer’s art took a huge turn about six years ago. A Fairfield resident and early tenant of the NEST Arts Factory in Bridgeport, he had focused on the sort of dark, floral landscapes once done by Flemish masters. Except Shaefer’s landscapes weren’t paintings; his were intricate mixed media constructions that achieved the same exquisite detail. Then Shaefer’s work suddenly got much simpler and very much bigger. He started drawing exclusively in charcoal. One of his first subjects was the trunk of a neighbor’s oak tree that might have come down during Superstorm Sandy. “I had never done charcoal. It just clicked. I always avoided it because it’s messy. I’m pristine. I like etchings,” Shaefer says. More charcoal giants would soon join his portfolio. He did a rhinoceros and a bison, each in three sections, 8-feet high and 14-feet long. He did a whole series of bulls and horses, not giants, but still large. He kept returning to trees, or more likely the remains of trees. He draws them as themselves, isolated without background, looking for the stories they tell with age. In 2015, he drew the still upright stump of a sugar maple so deformed by age that it can seem to have acquired human features, like a Tolkien tree creature. 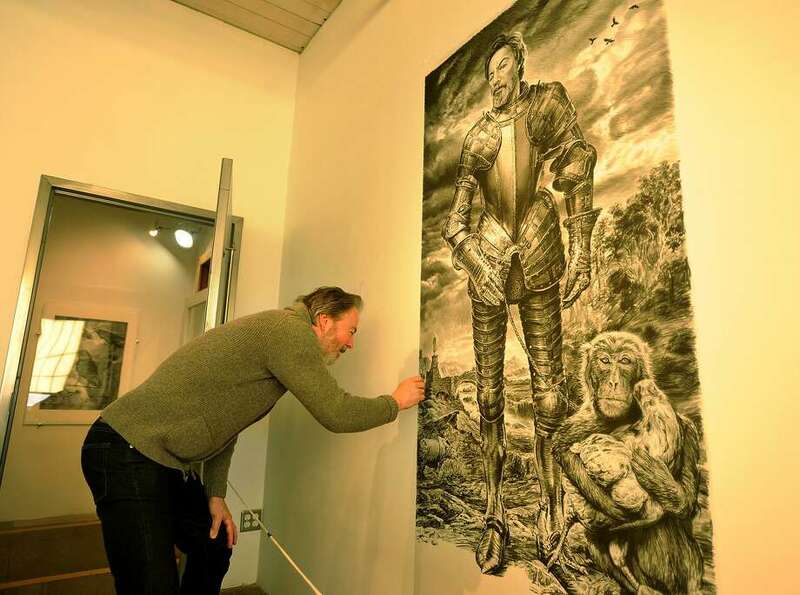 The 8-foot-tall drawing won Best in Show at the 2017 installment of the Art of the Northeast exhibition at the Silvermine Arts Center and earned Shaefer an upcoming solo show. He expects to exhibit his original fallen black oak and the toppled trunk of a white oak almost as large. Meanwhile, his monumental “Refugee Trilogy” that debuted at Fairfield University in 2016 traveled to Brigham Young University in 2017, to Marquette University this year and is set to go to Stetson University in Florida next summer. Prompted by Syrians then risking drowning to reach Europe, the trilogy marked the first time Shaefer addressed a current political crisis and made heavy use of human figures. But he still used charcoal and worked on a grand scale. Each of the three drawings, done on vellum, was 8-feet high and almost 14-feet long. They mimicked the kind of wall-filling historical paintings found in the Met or the Louvre. Nor were Shaefer’s refugees clad in lifejackets and clinging to rubber boats. They were timeless in their nakedness, some individual images borrowed intentionally from the old paintings and identified in exhibit brochures. The charcoal technique Shaefer discovered with the black oak was liberating for him and illusionary for the viewer. From a distance, or on a computer screen, his drawings look as finely detailed as an etching. Up close they dissolve. It took Shaefer several months to become comfortable with his new style that, despite the scale, was speedy compared to his earlier landscapes. Charcoal drawing was less precious. The scale was achieved by using a grid system. In his white oak, displayed outside his studio, any one square foot section can look like a swarm of slashes. Before turning to fine art, Shaefer had a career as editorial and fashion photographer. He studied art at Duke University, but important parts of his education came from museums in Europe where his father was stationed as an Army officer. He makes his affinity for old masters plain in both his early landscapes and the refugee trilogy. Unlike the others, it dwelt piously on sin and Shaefer did seven drawings, each 6-feet by 4-feet, depicting the seven deadly sins. He did not identify the sins with titles though. The drawings, in which flowers are stand-in for humans, are more suggestive of natural decay than hellish punishment. When the exhibit closed in October, Shaefer was already at work expanding his Refugee Trilogy to a series of five monumental drawings. The original three depicted a border crossing, a water crossing and a land crossing. Now he’s adding what he calls bookends to address two other refugee issues. “Why are these people on the road to begin with? Why are they escaping?” he asked himself. “And once they get someplace, they try to rebuild.” How will they do it? In his studio, both look near completion. He says he’s “put everything but the kitchen sink” in the drawing that will represent chaos and conflict. There are images of angels and animals and recognizable modern figures, like the fighter Conor McGregor. Also, for the first time Shaefer has drawn an image of himself. It’s in the lower right hand corner and shows him cradling a Christ figure, who is a fallen combatant. Joel Lang is a frequent contributor to Sunday Arts & Style.